When it comes to healthy eating i would say the meat of the meat of the bird which is descendant of red jungle fowl which was first domesticated 2000 BC in India and its called the chicken, one of the great gifts from God to humankind. Because the meat of chicken is found almost everywhere so the recipes of chicken meat are in hundreds if not thousands. Throughout history the chicken has been favorite meat of almost all the communities, from kings to farmers, from rich to poor it is the meat that everyone can afford. 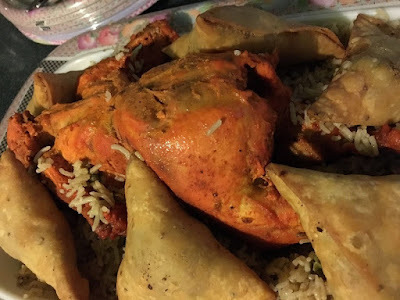 In India and Pakistan the most favorite chicken is called Desi chicken (home grown) and believe me the taste difference is incredible. The dish i am going to share today is called Deghi / Degi roast, probably one of the simplest and the tastiest dish from all the chicken dishes. 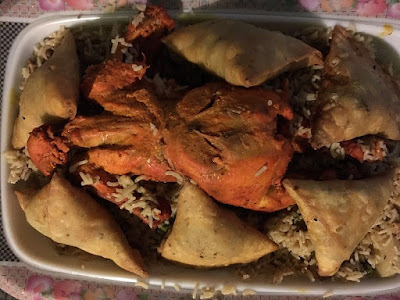 Best way to enjoy this dish is with salted rice and samosas. This chicken roast is not like your normal roast which normally is too dry to eat, this dish is not only delicious but juicy as well and kids love it. First time i tried deghi roast was in Lahore Pakistan but tell you truth it was too dry so i tried cooking it at home and it took me about 16 months to perfect it and i did, now we make it almost every week because the kids ask for it and they love it, we cook 3 chickens and they disappear within half an hour, while i am cooking kids will come to kitchen and ask if its done every 5 minutes. If you like it please do use comment box below and do not forget to subscribe our site to get updates on daily bases. Add water in a large bowl, add salt and soak the chicken for one hour. 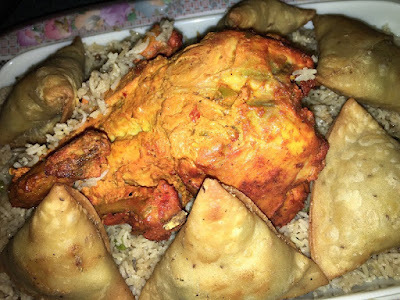 Drain the water and ad tandoori masala, half lemon juice and half yogurt, marinate the chicken till the chicken is well covered from all sides. Heat the oil in a large pan, add onions and cook till transparent, add salt, tomato puree, ginger & garlic paste, lemon juice, yogurt, garam masala, turmeric poeder and green chilies, cook on medium flame till it is like thick paste, take it off the heat and let it cool down. Marinate the chicken with the cooked paste and cover it, set aside for minimum 2 hours (overnight for best results). In a non stick pan add the marinated chicken, cover the pan with a lid and cook on low heat till chicken is nicely cooked (should be cooked in about about 40 minutes).